Kim Kardashian after channeling Jackie Kennedy for Interview Magazine,she has channeled style icon,Cher for Harper's Bazaar Arabia. She wore a glittering fringe number from La Bourjoisie. For the accompanying spread, Kim was styled by Simon Robins. 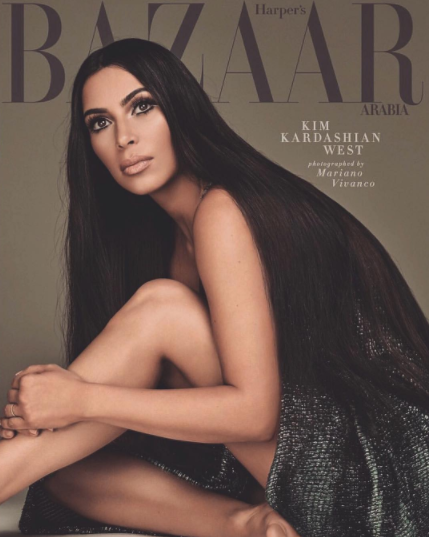 Kim Kardashian is on a roll with her September issue magazine covers. First, she appeared on Interview magazine as Jackie Kennedy, which caused quite the controversy online, and now, she's transformed into another style icon — Cher — for the cover of Harper's Bazaar Arabia released today.The reality star, photographed by Mariano Vivanco, channels the timeless goddess of pop with her extra-long mane, a shimmery dress with a down-to-there neckline and bold eye makeup.